You're ready to build the game packages! To get started, go on AdMob website and create an account. Once it's done, you can create a new ad unit. Then add your application by entering its name and choosing its platform (if your game is for both iOS and Android, you must register two ad units). You can then choose if you want to create the ad unit to display a banner or an interstitial screen. To begin, we're going to display a banner. Your object is now ready to display the banner! An interstitial screen is an ad that covers the whole screen and have a button to close it. It is usually presented at the end of a level. If you want to display an interstitial screen, you have to fill the interstitial ID fields (either for iOS or Android, or both) and use the action to show the interstitial screen. For example, you can add this action when you detect that the player just ended the level, or at the beginning of a scene displaying the game ending score. By default, the AdMob object is in testing mode: it can be used to display fake AdMob ads and be sure that everything works. When exporting your game to publish it, be sure to uncheck Testing mode. To enable AdMob ads, you must export your game with Intel XDK 1). 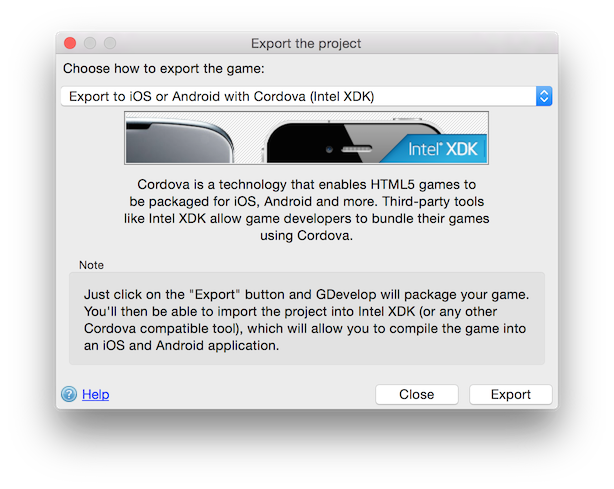 In GDevelop, export your project and choose Export to iOS or Android with Cordova (Intel XDK). When export is done, import your project in Intel XDK. Don't know how it works? Go read the Intel XDK tutorial! In a nutshell, you have to open Intel XDK, click on Start A New Project, then Import Your HTML5 Code Base, choose the folder where your game was exported and click on Continue. When your game project is opened in Intel XDK, you have to enable a third party plugin that will allow to display the ads. Enter AdMob plugin as the name of the plugin (it does not really matter), then com.google.cordova.admob for the Plugin ID. 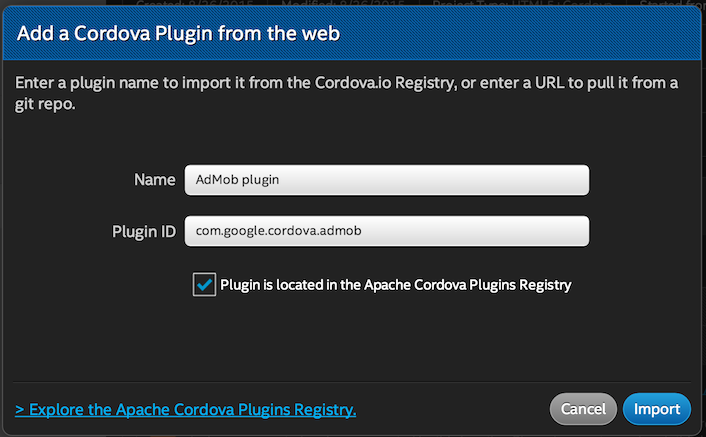 Finally, check Plugin is located in the Apache Cordova Plugins Registry and click on Import when you're done. You can now build your game using the Intel XDK as usual: basically, in the Build tab, choose Crosswalk for Android or iOS. You have activated the plugin as described. You have put the AdMob object somewhere on the scene. You have entered the right Banner or Interstitial ID for the right platform. 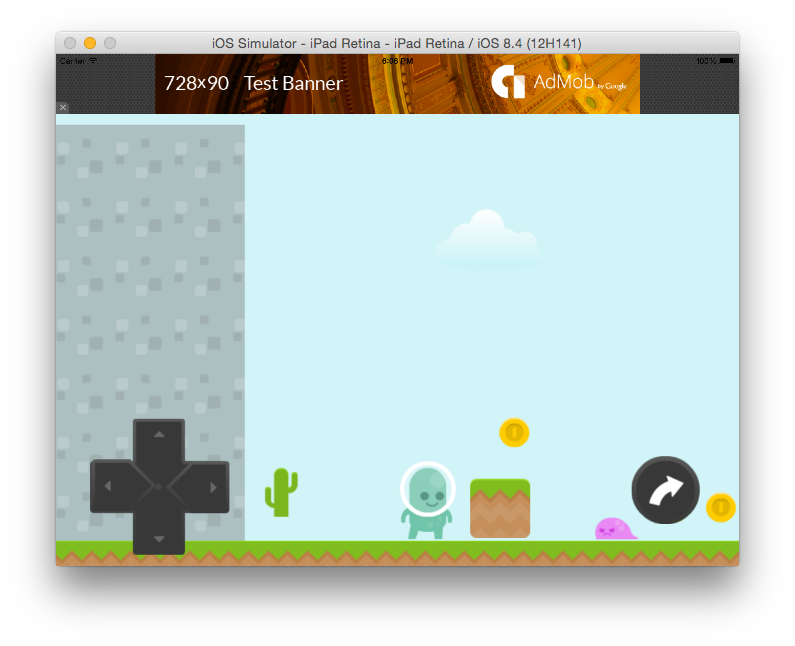 Activate Testing Mode (that's done by default) the first time you try to integrate ads.